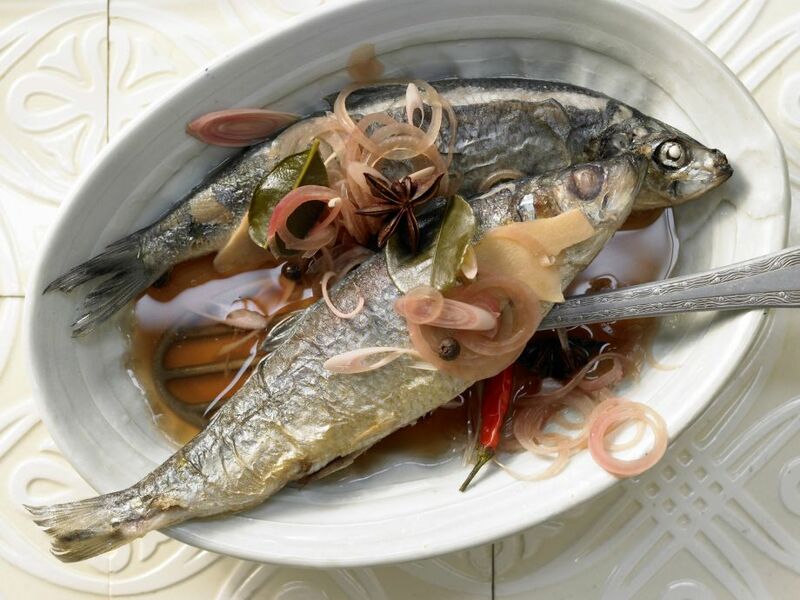 1 Rinse herring thoroughly, inside and out, then pat dry and season with salt and pepper. Coat lightly with flour, tapping off excess. 2 Heat oil in a large pan over medium-high heat. Cook herring until lightly browned, about 4 minutes per side. 3 Transfer fish to a deep baking dish or bowl. Let cool slightly. 4 Peel onions and thinly slice. Peel and thinly slice ginger root. Peel outer layers from lemongrass and cut inner part into small pieces. Rinse lime leaves, shake dry and cut into smaller pieces if desired. Rinse chile, wipe dry and halve lengthwise. If you prefer less heat, remove seeds and ribs. 5 In a pot, combine vinegar, 200 ml (approximately 1 cup) water, 1 teaspoon salt, the sugar, soy sauce, onions, ginger, lemongrass, lime leaves and chile. Add star anise, allspice and peppercorns and bring to a boil, then simmer over low heat for 10 minutes. Remove from heat and let cool for about 5 minutes. 6 Pour the warm marinade evenly over the fish and let cool completely. Cover with plastic wrap and let marinate in the refrigerator for 2 days before serving.